Sand and water play is a social activity as children play together. They will work together to solve problems and share ideas and concepts. This type of learning helps children to develop their social and negotiating skills. Sand and water play helps strengthen children’s large muscles as they use these muscles to dig and scoop sand and pour and splash water. As children are pouring the sand and water into containers they are also improving their fine motor skills and hand-eye coordination. 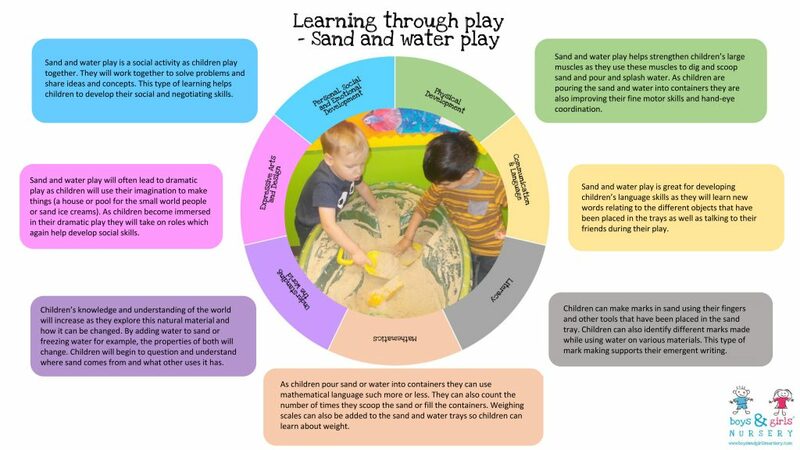 Sand and water play is great for developing children’s language skills as they will learn new words relating to the different objects that have been placed in the trays as well as talking to their friends during their play. Children can make marks in sand using their fingers and other tools that have been placed in the sand tray. Children can also identify different marks made while using water on various materials. This type of mark making supports their emergent writing. As children pour sand or water into containers they can use mathematical language such more or less. They can also count the number of times they scoop the sand or fill the containers. Weighing scales can also be added to the sand and water trays so children can learn about weight. Children’s knowledge and understanding of the world will increase as they explore this natural material and how it can be changed. By adding water to sand or freezing water for example, the properties of both will change. Children will begin to question and understand where sand comes from and what other uses it has. Sand and water play will often lead to dramatic play as children will use their imagination to make things (a house or pool for the small world people or sand ice creams). As children become immersed in their dramatic play they will take on roles which again help develop social skills.